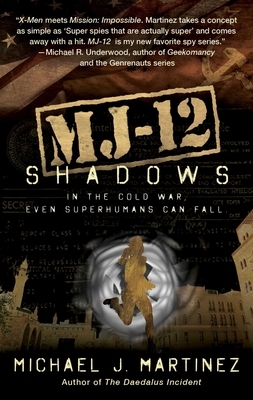 A team of superhuman spies navigate dangerous global espionage in the sequel to the paranormal historical thriller MJ-12: Inception. It’s 1949, and the Cold War is heating up across the world. For the United States, the key to winning might be Variants—once ordinary US citizens, now imbued with strange paranormal abilities and corralled into covert service by the government’s top secret MAJESTIC-12 program. Some Variants are testing the murky international waters in Syria, while others are back at home, fighting to stay ahead of a political power struggle in Washington. And back at Area 51, the operation’s headquarters, the next wave of recruits is anxiously awaiting their first mission. All the while, dangerous figures flit among the shadows and it’s unclear whether they are threatening to expose the Variants for what they are . . . or to completely destroy them. Are they working for the Soviet Union, or something far worse? Michael J. Martinez is a critically acclaimed author of historical fantasy and genre-blending fiction, including the Daedalus trilogy of Napoleonic-era space opera novels and the MAJESTIC-12 series, both from Night Shade Books. He lives in New Jersey with his wife, daughter, two cats, and several chickens.